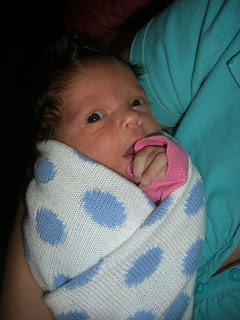 Maxine Louise is our brand new baby girl, born July 25, 2008 at 12:14pm. I couldn't have imagined an easier birthing experience, to say the least. In the photo above she is 11 days old. 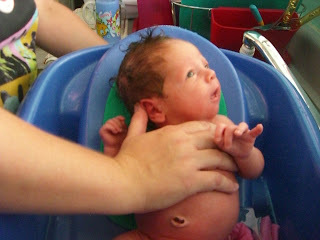 And below are pictures of her first real tub bath since her umbilical cord stump fell off. These pictures were taken this morning. She does not enjoy baths yet. 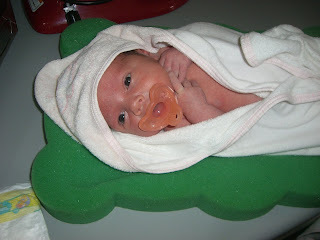 She started crying shortly after that first shot and was very relieved to be wrapped up in her towel afterward. how cute... i can't wait to do all that! I'll have to show you my idea for our nursery. We are going up to richmond to shop for stuff this weekend. How is Maxine doing breathing/feeding wise? What sweet moments: The bath and the smile at you. She is so perfect. I think she may be a calm and quiet one :) We'll see soon!